Sometimes you just want cookies. On grey rainy days (like when I made these to share with you) they just make things better. There’s no better way to cheer up than to take a recipe generations of kiwis have enjoyed (and which came off the side of a tin of condensed milk if I remember correctly) and give it a fun new twist. 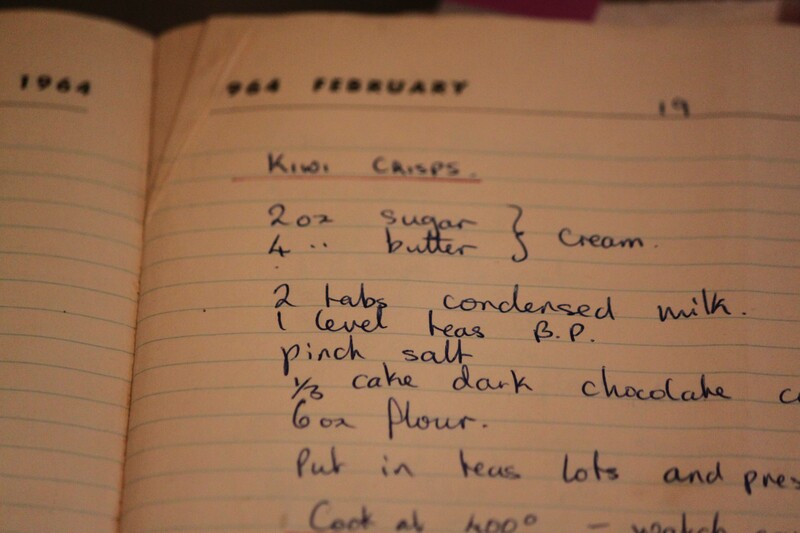 My mother wrote this entry into my grandmother’s recipe book when she was a child. The only changes I’ve made are to use brown sugar instead of white – for more caramelly depth of flavour – and to stuff them full of mini M&Ms instead of chocolate chips. Got no M&Ms on hand? Jump right in with whatever chocolate chips you have! Cream the butter and brown sugar until fluffy. You will need to spend a good five minutes to get the sugar to dissolve and incorporate some air. It doesn’t seem like long until you time yourself but stick with it – it will make a big difference to the results in this and other recipes. Beat in the condensed milk, then stir in the sifted flour and baking powder. Since this isn’t a cake you can cheat on your sifting by whisking it in a bowl with a balloon whisk a couple of times. Lastly mix in the M&Ms. I find this ends up being easier to do by hand as the dough is fairly stiff. Just squish it like playdough a couple of times until the M&Ms are mixed in. 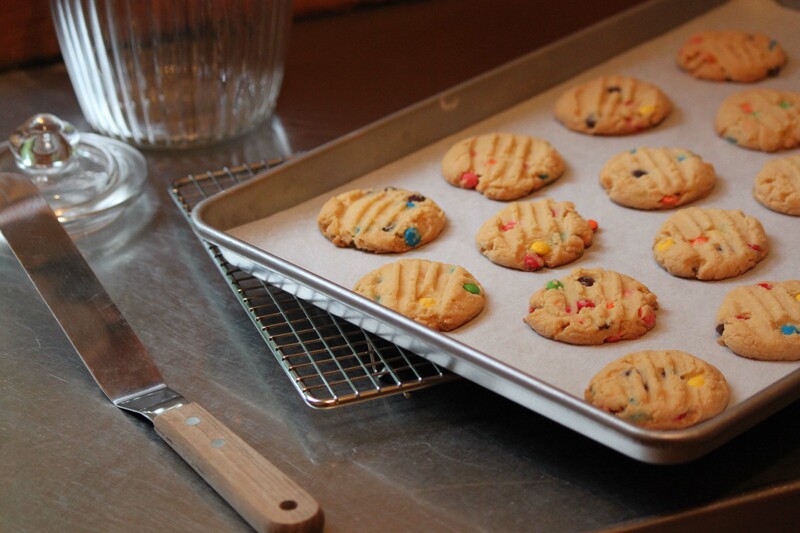 Scoop tablespoons of mixture (about 1 oz each) onto a baking tray lined with baking paper. Using a fork dipped in flour flatten each mound of dough to about 1 cm (half an inch) thick. Allow a bit of space between but they won’t spread much. Into the oven at 180C (350F) for 20 minutes, rotating the trays halfway through. They should be pale golden on top and dark gold underneath. I would make sure you get your share as these won’t last long especially with hungry kids (and grown ups) around! 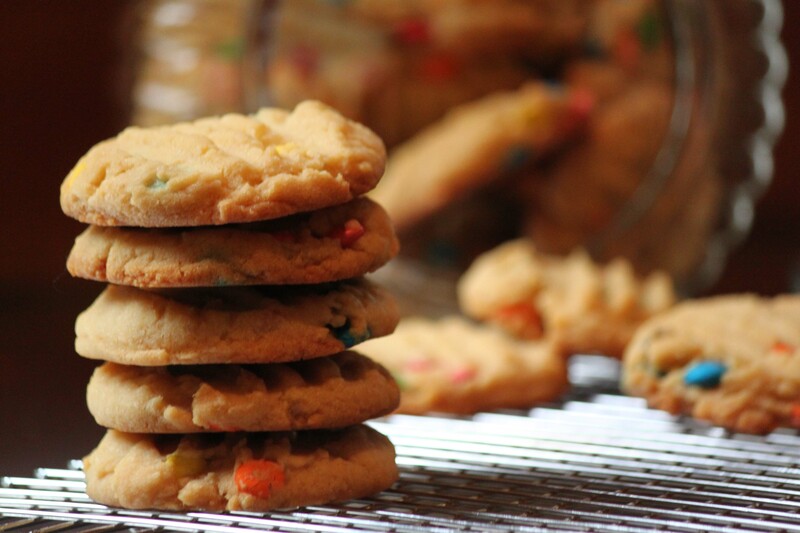 Golden buttery cookies studded with mini M&Ms – who needs to be a grown up all the time? Preheat the oven to 180C (350F). Line two large cookie sheets with baking paper and set aside. Cream the butter and brown sugar until pale and fluffy and the sugar has been completely blended in – at least 5 full minutes. Add the condensed milk and beat again until combined. Scrape down the sides of the bowl to make sure everything is mixed in. Stir in the flour and baking powder. 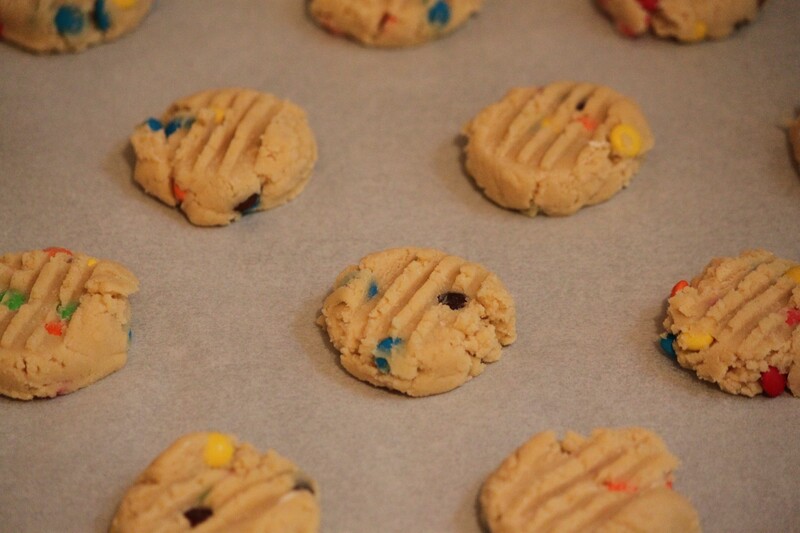 Mix in the M&Ms last using a spoon or just your hands – it can be easier to get them distributed in the dough this way. Scoop tablespoons of mixture (approx 1 oz each) onto the prepared sheets leaving 5 cm (2 in) between each. 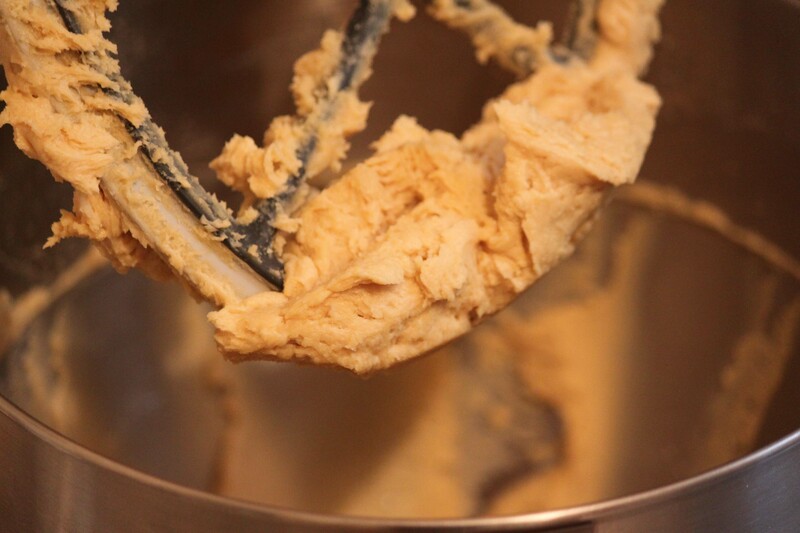 Flatten the scoops of dough to about 1 cm (half an inch) thick with a fork that has been dipped in flour to prevent it sticking (dip the fork after every 3-4 cookies). Bake for about 20 minutes, rotating the trays halfway through. The cookies should be pale golden all over and dark gold underneath. Check at about 15 minutes to see if they are done as ovens can vary. Transfer to a wire rack to cool. Adapted from generations of New Zealanders!